DECEMBER 11, 2014 -- January 1, 2015 marks a major milestone in preventing oil spills. That date is the deadline which the landmark Oil Pollution Act of 1990 (OPA-90) specifies for phasing out single-hull tankers in U.S. waters. That act, passed after the 1989 Exxon Valdez oil spill in Prince William Sound, Alaska, required that all new tankers and tank-barges be built with double hulls. Recently constructed single-hull tankers were allowed to operate, but 25 years after the Exxon Valdez, those vessels are now at the end of their operational life and will no longer be able to carry oil as cargo. The requirement was phased in gradually because of the difficultly of converting existing single-hull tankers to double hulls, and retiring the single-hull tankers more rapidly would have been a major disruption to world shipping. There won't be a dramatic change-over on New Year's Eve; most of the tankers calling on U.S. ports have had double hulls years before this deadline. However, one ship which was not switched over to a double hull soon enough was the tanker Athos I. This ship, carrying 13.6 million gallons of heavy crude oil, struck a submerged anchor in the Delaware River and caused a relatively large, complicated oil spill near Philadelphia, Pennsylvania, 10 year ago. In 1992, two years after the Oil Pollution Act, the International Convention for the Prevention of Pollution from Ships (the MARPOL Convention) was amended to require all newly built tankers have double hulls. MARPOL has been ratified by 150 countries, representing over 99 percent of merchant tonnage shipped worldwide. So, what is the big issue around single vs. double-hull ships? Historically, tankers carrying oil were built with a single hull, or single shell. While we measure oil in barrels, it is not actually shipped that way. Instead, oil is pumped into huge tanks that are part of the structure of tankers and barges. For vessels with a single hull, one plate of steel is all that separates the oil on board from the ocean. 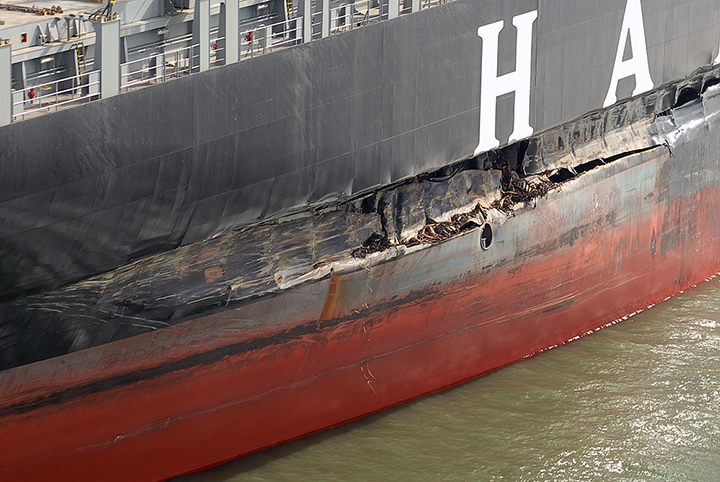 If the hull were punctured from a collision or grounding, an oil spill is pretty much guaranteed to follow. On the other hand, a ship with a double hull has two plates of steel with empty space in between them. The second hull creates a buffer zone between the ocean and the cargo of oil. 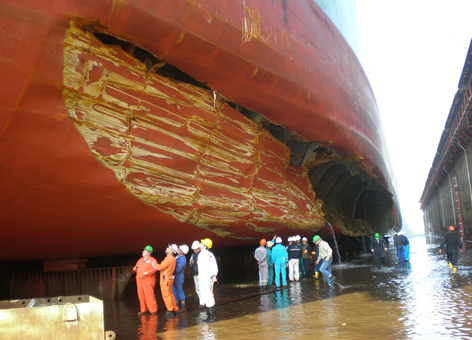 Naval architects have debated the merits of various hull designs in reducing oil spills, and using a double hull, essentially a hull within a hull, was selected as the preferred vessel design. However, the double hull requirements only apply to tankers and tank barges. Container ships, freighters, cruise ships, and other types of vessels are still built with single hulls. While these ships carry a lot less oil than a tanker, a large non-tank vessel can still carry a lot of fuel oil, and some have caused some pretty big spills, including the 2007 oil spill caused by the cargo ship Cosco Busan in San Francisco Bay. Of course, double hulls don't prevent all oil spills from tankers either, but the design has been credited with reducing the amount spilled, especially in the cases of low-speed groundings and collisions. And some pretty spectacular collisions have resulted in double-hull tankers not spilling a drop. Twenty years after the Exxon Valdez oil spill, the Norwegian tanker SKS Satilla collided with a submerged oil rig in the Gulf of Mexico. The collision tore a huge hole in the side of the oil tanker, but, thankfully, none of the 41 million gallons of crude oil it had on board was spilled.